Michael Aspel visits Mount Stewart in Northern Ireland. Treasures include a painting once thrown on a skip, and a memento from Laurel and Hardy. Browse content similar to Mount Stewart 1. Check below for episodes and series from the same categories and more! to County Down, 15 miles from Belfast. Here the Ards Peninsula separates the Irish Sea and Strangford Lough, a tidal inlet rich with wildlife. you can see the Mountains of Mourne sweeping down to the sea. as a place for mirth and jollity. so an underground passage led to a wine cellar and pantry which supplied many a banquet and picnic. who've held a lofty position in British society for generations. Classical elegance combines with homely Victorian decor and the occasional flash of exuberance. and caricatured busts of well-known leaders. The Londonderry heirs also shared a knack for wooing rich and influential women. who founded the dynasty with her husband Alexander Stewart. and, in time, sons who would prove attractive to future heiresses. and this very big red book records their visit here in 1903.
including 13 valets, and 10 detectives. There were eight firemen...probably watching the King's cigar butts. The gardens at Mount Stewart were designed 80 years ago by Edith, wife of the seventh marquis. We'll take a look at her handiwork in the second programme. For now, let's concentrate on the Italian garden for another al fresco Roadshow. She came from my aunt's house to our house. -She's been in our home for about 40 years. apart from I found out he also did a bronze that's standing outside Selfridges in London. you get lots of French bronzes of nubile ladies, big hoops. I mean, this is the age of keep fit, isn't it? we're dealing with an English rose, dare I say? but the point is, stylistically, it's an Impressionistic bronze. It happens to be by one of my favourite sculptors. His name's round here. Let's have a look at his name... Gilbert Bayes. Um, we appear to have a date. If you can just see "25" within a circle, and 1925 would be about right for this figure. and he is very well respected, and quite rightly. He's a very inventive sculptor. You can't help but touch it. Maybe I have a problem. Girls with hoops, what's the going rate in Northern Ireland? -So if I offered you £1,000, you wouldn't be very keen to accept £1,000? I wouldn't hesitate to probably put £4,000 on it. -Think what she'd have been worth if she'd been clothed! -Where did you get this cloth? -A local market about 25 years ago. -I'd think, at the most, £2. Let's just stretch it out. £2? You must be joking! -Before decimal! With old money? -That's a brilliant thing, isn't it? That's full of geometry, but yet you've got organic growth. These pink designs are supposed to be carnations and poppies. and this thing comes from Central Asia. It comes from close by the Caspian and it's called a suzani. If you notice, it's been done in various strips. -I'm afraid women do have a propensity to chat amongst themselves. ..that is why that flower doesn't quite match up. It's the naive village craft. and they're doing it in around about 1900 which, in suzani terms, is quite an early period. It's a high quality piece of work, and it's survived in a good state. -Now, how much did you pay for it? -I think about £2 about 25 years ago. -Well! What do you think it's worth now? -If you were selling it at auction, you'd get between £2,000 and £3,000. That was a very good investment. Good investment?! I should say so! -Oh, yes! Wonderful, wonderful, wonderful. ..which is one the earliest pieces of domestic furniture made of mahogany I've seen in 40 years. -Everything's right - the turning on the columns. -No, that was done on a pole lathe. -and it spun this way, then that way, and created all these wonderful bits of turning. -Absolutely, absolutely. And the original feet. Let's stand it up and look at the thing properly. Well done. -Now, there again, just down here, you see, this one is perfect. -you can see why. People have sat round. -There's been a few feet under here! the top's a strange colour, because it's been stripped at some time. I don't know when. 50 years ago. -You know? You had it done? -When it came into my possession. -and I was lucky - sometimes it was done with a pin! That's the sort of guy he was. That beats writing on the hand, doesn't it? you think, "Uh-oh," but there's no doubt that's perfectly OK.
-Is that right? So it's as old as that? I'll tell you what, it's still worth £12,500. Now can I tell you a story? and they said, "Mmm, nice table. "Yeah, £400. It might make, on a good day, £500". -That would've been a bad choice. -That would have been a bad deal for me. Are you serious on the £12,500? Absolutely. This is one of the best examples you could ever wish to see. Thank you. They vary enormously in quality. but they're - when they're good - they're really nice and I love this one. My mother was English and her great grandmother used to travel to the Far East in her bath chair. -she just loved to travel. Way beyond her time. and, as a child, we used to go and look at her ivory collection, and this was one of my favourites. You're right, it's a charming subject. This is as good as it gets. made from woven bamboo, which is the traditional way of doing it. and a couple of chicks. It's all in sparklingly good condition. one would expect an estimate of somewhere around £800 to £1,500 on it. My goodness! Thank you very much. That's lovely. Hello. My golly, that looks like John! Give me your glasses, give me your glasses. That's you, Henry! That's definitely your father, John. Never seen it before in my life. Well, um, it looks like Souter Johnnie, doesn't it? -As in Tam O'Shanter and Souter Johnnie. -What do you think, John? -It's too well modelled for some of the Scottish ones. -This is a good, good model. You do get Doulton and Potts models of that. -Do you pour the drink out of there? -Out of his hat, yeah. You drink it from there? we'd pour it into a glass or a cup, Henry. -OK, we'll go with that. -This is an interesting autograph book. It's yours, presumably? -Laurel and Hardy in it! -So you're Margaret, are you? -Um, did you send away for it or...? No. Our neighbour in Belfast - we called him "Pop" - he had to do with the opera house in Belfast. down at opening night and take us back to meet who was performing. That particular night it was Stan and Ollie, and they were lovely. and put our name on it for us. -It would've been in the '50s when I got it. -It's nice to actually know that you've seen these signed with your own eyes. -So you spent five or ten minutes with them? -We don't often see Laurel and Hardy autographs. I think it has a value of around £200 to £300. an audience-eye view of the best double act in the antiques business, the Sandon Boys! Difficult to tell which is which! -Even though it's not a Worcester. Now the mark has worn off on that one, but why does the mark wear off sometimes? -It's OK on the saucers. -Have you been washing them badly? -You hit ME like that! -Well, learning about the porcelain. No, looking after porcelain is a bit like looking after a man, really. LAUGHTER Lots of love and kindness and warmth, and very little washing. Now I've got to stop it! -Can you tell me where you...? -..and ended up with my uncle, then came to me. -He lived in America or visited? was quite good at the time. In fact, it has quite a reasonable value. -even though it's still quite a popular toy. This is one of the most unusual clocks I've seen. Do you know where it came from originally? No, the wife purchased it locally from a collector who was moving house. He had the clock running on the outside of one of his buildings. -As I'm sure you know, it's a turret clock. -A nice example of a turret clock. and the great thing about it is that it shows us in great detail how these things work. is James Drury of London, and it's actually dated 1738.
so this is excellent to see one of his pieces that is signed and dated. which you've obviously used to wind this up. That's the winding square and this one here is for setting the time. with some wonderful hands, and this would now be striking on a superb bell, ringing out across the land. All in all, I think you're jolly lucky to have got it. -How long had the collector had it? -I think he had it about 12 years. Right. And he simply has no idea where it came from? Well, to anybody vaguely interested in horology, this is a very good example. I think to the right collector, you'd probably double your money. -It's great you've got it on the stand. Do you have it working at home? -and that's what this is. The steward would fill the copper reservoir with water. You'd keep in this compartment your toothbrushes and your flannels and your washing accoutrement. Wow! ..the wash-hand basin, which would be filled by pressing this little nickel tap. and when that needs to be disgorged, you undo the bottom flap and take out this. When it's full, chuck it overboard. Where did you get it? -I went to an auction, you understand? -And it was sort of antiques at this auction. -And that's why it was so expensive. -Did you have to pay a lot, then? -Well, I paid £52 in old currency. -What - in the 1950s? -Gosh, that was a price! If you were selling it at auction in a marine sale, I think you could get between £200 and £300 for it. After all those years, and keeping anything myself for 50 years! -And I can only get £400. -Well, £400 top end, I reckon. -I never heard the like! It belonged to the Third Marquis of Londonderry when he was an officer in the Second Lifeguards. -The man who lived in this house. What you have here is the 1832 pattern heavy cavalry sword of the Household Cavalry. -Now, he was in the Lifeguards, wasn't he, the third Marquis? Second Lifeguards, and so this would be 1832, so he carried this in, say, the 1840s and 1850s probably. He carried it at the Duke of Wellington's funeral. -The sword itself is in remarkable condition, isn't it? and it could be a sword worth £3,000, £4,000, £5,000. -and you have the provenance. Wonderful. How do you tell a hand-painted plate and a lithoprint apart? It's not too difficult, if you look closely at it. There's different forms of printing. This is printed in outline. and then, if you want, you can colour it in, like that. -That's the same subject underneath. -Hand painted over a print. Yeah. and then the painter, with great skill, has to paint it over. and are the mass production work of today's generation. If you look carefully, perhaps with a magnifying glass, you can see all the little screen printed dots. -The whole thing is a mass of dots. so that's a screen-printed litho, which is mass production, thousands of them made at a time. -Yes, because people pretend it's painting. Now, this, you see, IS painting. This is quality painting of the first order. perspective, even the gold - by hand, that's a master plate. -Nothing at all. Everything is washed and beautifully done. -You need a magnifying glass. -Much better to use a magnifying glass. They're both of about 1780 in date. One is Chinese, one is English. and the English one is printed. because the blue tends to blur, but can you tell which is the painting and which is the printing? -That's the printed one and that's the hand painted. -So a complete waste of time! finely done by the Chinese, but this is English transfer printing, going back 220-odd years. -They're both cracked. So am I! but what intrigues me is what is the subject? What's happening? -Poor lady, having to sell her jewellery. ..and he is appraising it for her. I'm not too sure that she's also too happy with the value. -She's looking slightly apprehensive, isn't she? As if waiting for the figure the pawnbroker's going to mention. Yes, well, this is typical of Kennington's sort of dramatic pictures of upper class life. and he moved towards paintings of elegant Edwardian ladies, which is what he's best known for. -And sometimes they are slightly... pictures with a...with a problem. -The picture's in good condition, though it's rather dirty. I'd recommend a good clean of this. would all come up much brighter and crisper than it looks now. -As to value, well, I think in a sale now you'd get £10,000 to £15,000 for this. -Oh, that's fine. Very nice. -I think insurance, tell them £20,000. -Yeah, well it won't move from its present position. It belonged to my husband's family. They were jewellers. That is nothing to do with it, except that they collected things. -So it's travelled a long way? You brought it from there? Yes, when the parents died, we had it, then my husband died, so I've had it all those years. but it's got a bit of design. -The family was a Huguenot family. -Huguenot family from Normandy, originally. I've got it right, then, haven't I? I think that is pewter. Circa...maybe 1880, something like that. Would that sort of fit in? I'd imagine so. I'd imagine so. -you'd be probably paying something like £1,500 for it. Are you a collector of Scrimshaw? I'm interested in whaling. I wrote a book about Irish whaling, so I've an interest in scrimshaw. -Was there a whaling industry in Ireland? then there were two Norwegian companies in the 20th century. -So you bought these due to their whaling connections? -When did you buy them? I bought this one last year in Portobello Road. -I bought this in the Angel the previous year. And I bought this in a local antique shop. on walrus tusks and so on, are of great interest. It's a whaling and zoological association, really. -You're aware that they're quite collectable. Can I ask what you paid for them? I bought two of these... The other one there... ..at £300. Did you have any...? Did you ever have any doubts about them? Did you think they were OK? No. I reckon those are sperm whale teeth and this is walrus tusk. I have my thoughts on this, but I'd like to get a second opinion from a colleague. These are super - 18th century sporting buttons. What's so super, with each of these, we have the names of different dogs. These would've been the real names in the 18th century, dogs belonging to the chap wearing these buttons. I mean, it's magic when you think about it. I think we'd be looking at at least £1,000, and probably more. -I thought he bought rubbish. -which is completely the wrong price. -It's either grossly too little or grossly too much. My feeling is, you're right - it's grossly too much, but I'm not sure. -A whale coming up under a boat. -Whale coming under a boat. -Wouldn't want to stick my neck out. My day would not be complete without finding an Irish peat bucket. That's what it is. Of its type, it's as good as you'll find. This ribbing round here is typical of Northern Ireland and Scotland. I mean, this is the luxury model. Most of them are quite plain. And the value - round about £3,000. -Put your Christmas tree in it! Two areas of difficulty - these ARE old teeth, no doubt about that. As you know, those survive in large quantities. who should know their business, was simply not enough. Secondly, the dating of the engraving. I've never seen a real one titled "Whaling in Greenland". things that appear to tie in a particular moment in time. but it's the fact that it's dated makes me suspicious. but they don't put it all in with flags and bells. if this scene is real, this is one of the best we've ever seen. If it's added later, the whole complexion changes. Someone had dated the rigging on the ships for me at around 1860s. -That just means they've been accurate in their use of past records. All I'm saying is, I am suspicious. I'm not saying... I think those are very dodgy indeed. It may be fantastic, but there are things about it that make me worry. -they are borne out by the fact that the prices don't make sense. should know one of that quality is £800. -Do you see what I mean? -but I have reservations about that one. -It came from Germany, I think. -Yes. OK, let us agree. -We're both doubtful about those. -This one I'll reserve judgement on, too. -We have come across pieces where the engraving is clearly later. is doing something which is very difficult to date. -There is so much that is wonderful on it, if it's real, you've a fantastic bargain. If not, it wasn't such a bargain. -It's lovely, but let's leave the jury out on that one. -We hope it's right. Thank you. It belonged to my grandmother. All I know is her father-in-law give it to her. -Pretty lavish gift! Two whopping great diamonds. the diamonds are laid into channels, then they're cut away to leave them as fine as possible. Beautiful English jewellery. You've never worn it, have you? -Do you know how I know that you haven't worn it? -There's no perfume on it. -Well, there will be soon. -When we turn it over it's perfectly obvious there's no way to wear it. There's a loop to hang it from a pendant. And see this fitting here? It has a thread in the middle for a screw fitting, then two prongs to hold that thread steady. and also to wear it as a pendant, so it's very versatile. -Beautiful. Were you excited when you saw it? People want to know what it's like to wear something as beautiful as that. set with diamonds, made in about 1900 at a time when entertainment was very, very important. This sort of jewellery was worn on great occasions. You couldn't hope to have anything more beautiful to wear. -Going to wear it then? Of course you're going to wear it! We'll get a fitting put on and you must have a go at this. and looks like the odd dog's run over it over the years. I mean, where has it been? -So it's been lying in the shed for many years? It was in a terrible state, but I thought, "Well..."
She associated no worth to it, I suppose. It wasn't really her kind of thing. -we wondered if she was given it when she got married a long time ago. You can see, if you look closely, that there's a linked A-E.
which is a nice period in the work of Everson. -This is typical of his style. -Do you know what it's of? -but you can see, albeit in rather a faint hand, the inscription for "Haarlem". Now, Everson studied in Amsterdam. ..but he is regarded as one of the more interesting of the Dutch town painters. things can be done to repair aspects of this. -This is the most difficult area, where an area of canvas has been lost. So what's necessary is a fairly major restoration job. -I think it could make in the region of £20,000 to £30,000. -I didn't think it was worth anything, so there you go. A really handsome pair of dishes. Are they yours? -Yes. Well, my sister's and mine. -So you've got one each? -Are they hanging on the walls at home? near Moy in the late '40s. These were made at Arita in Japan, which was the main port in the centre. and exported out through there by the Dutch. It's the sort of thing you find more in Holland than in this country, although there are a lot over here. and they...they symbolise purity amongst other things. We've got precious objects and diapers surrounding the scene. What have we got on the back? left from the firing points where it was resting in the kiln. is one of the most extraordinary bits of suspension I've ever seen in my life. ..and they've survived in extraordinarily good condition. Do we have them insured? -Do you know how much your house insurance pays out if you damage them and they're not specified? Do you know what this pair of dishes is worth? -My goodness! As a pair? -It wouldn't make a great deal of difference. I think you could say £8,000 without any trouble at all. Mount Stewart was originally called Mount Pleasant. We intend to repeat the pleasant experience and come back here for another show. Many thanks to Lady Mairi and the National Trust for their kindness. I'm off to sample the local scallops, so until next time, from County Down, goodbye. 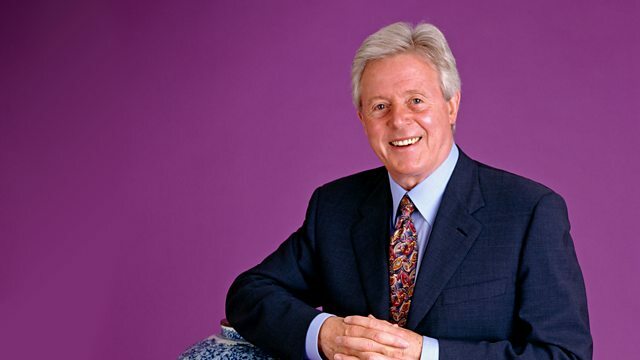 Michael Aspel takes the Roadshow to visit Mount Stewart in Northern Ireland. Treasures include a valuable painting once thrown on a skip, a memento from Laurel and Hardy, and Henry Sandon is introduced to a mug bearing his spitting image.